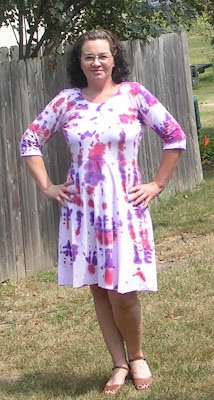 The Bobbilicious Files: Dye - Licious! The dress is the Ballet Dress from Dixie DIY. I've seen several versions around the blog world and wanted one for myself - and the pattern is remarkably affordable. I used a white jersey sheet and am very happy with the way this dress feels. It's like a big tee shirt. When I make it again, though, I will lower the waist a couple of inches. To dye it, I accordion-folded it lengthwise and tied it with yarn (because I didn't have big enough rubber bands) and gently squirted blue, purple, and wine colors on. Unfortunately the wine separated, so I put pink over the orangey spots. I really like how it turned out. This second project is all girl child. She watched a couple of tutorials on you tube and did it all herself - I just stood by and watched. I love how they look. 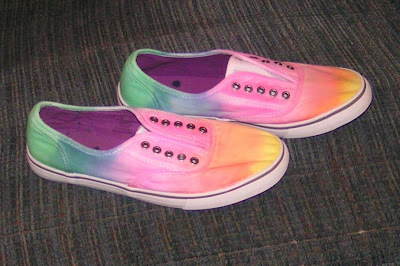 She is planning on adding another layer of the dyes to make them brighter. Didn't she do a good job? I have a couple more white sheets to sew with. Is it crazy to plan my sewing projects with the dyeing in mind? Speaking of projects - I've joined another sewalong! I'm doing the Fall For Cotton with Tasha and Rochelle. My plan is to use one of the patterns from my aunt with some polka dot cotton that I got last spring. When I get my zipper and buttons figured out I'll show you. If you're interested in sewing along, it starts September 1. There's a flickr group to share projects and ask questions. I'm kind of nervous about using a pattern that's nearly 70 years old - what if I mess up the pieces? I plan to trace it out and not cut from the original pieces, but things happen. I'll have to keep reminding myself to take it slow and relax. (I can't figure out how to add the button to my sidebar. When I do, you'll see it top right.) Finally for today, there's another heat wave going on in this part of the country. If it affects you, please try to stay inside and stay hydrated. I want you all to be healthy!